Halloween is so much fun for kids. And having a Halloween party is a great opportunity for them to wear their costumes, play games and of course, enjoy great food. If you are looking for some fun Halloween party recipes for kids, then be sure to check out these yummy recipes that are sure to please even the pickiest eaters. 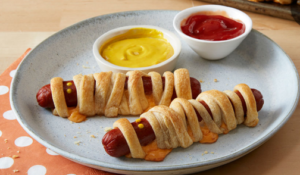 From mummy hot dog wraps to fun Halloween inspired pizza, the kids are sure to enjoy them all! These recipes are not only kid approved, they are also easy to make and call for just a few simple ingredients. From appetizers to desserts, here are five delicious recipes that that are perfect for kids, but the grown ups are sure to enjoy them as well! These mummy hot dog wraps are very popular, and they take a few minutes to put together with just three ingredients plus ketchup and mustard for dipping. The kids love these and they make a great appetizer or entree. 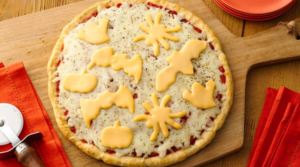 Most kids love pizza, and this Halloween cheese pizza is so simple to make with Bisquick and a few other simple ingredients. You could even save a step and use prepared pizza dough or a ready-made pizza crust to get this tasty pizza on the table in no time. 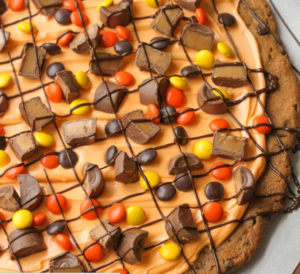 This Halloween cookie cake is sure to please the kids. It also goes together quickly since you simply use refrigerated cookie dough and canned frosting. All you need to do is give the cookie time to cool before frosting and decorating. It’s hard to resist this delicious blend of sweet and salty. 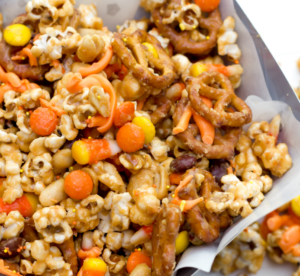 The popcorn, pretzels, salted peanuts and candies are drizzled with a delicious, peanut butter and homemade caramel mixture for the ultimate treat that both kids and adults are sure to enjoy. Tip: Some readers had issues with the caramel mixture burning in this recipe so be sure to read the comments below the recipe for tips on how to avoid this. 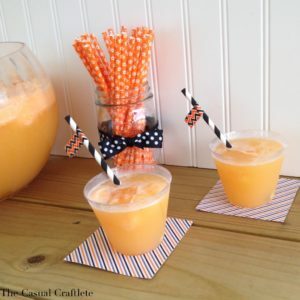 There is nothing more refreshing than a nice cold punch, and this Halloween Orange Sherbet Punch packs in a lot of flavor with just a few ingredients. You don’t have to worry about it getting watered down since the ice cubes are made with orange Kool-aid and add even more flavor as they melt. Just five ingredients is all it takes but plan ahead and let the ice cubes freeze overnight. These are just a few ideas for a delicious Halloween party recipes for kids. You could also add a few healthy Halloween snacks such as these cute tangerine pumpkins and these witch’s broomsticks made out of pretzels and cheese. Are you planning on having an adult only party? Then be sure to check out these delicious Halloween party recipes for adults as well. 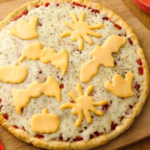 This entry was posted in Recipes and tagged Halloween Cheese Pizza, Halloween party recipes for kids, Halloween popcorn, Halloween punch, healthy Halloween snack ideas for kids, mummy hot dog wraps, Peanut butter monster munch on August 14, 2016 by Halloween Inspired.